Category Archives: It’s the Keys! Note: I’m back-tracking here, I know. 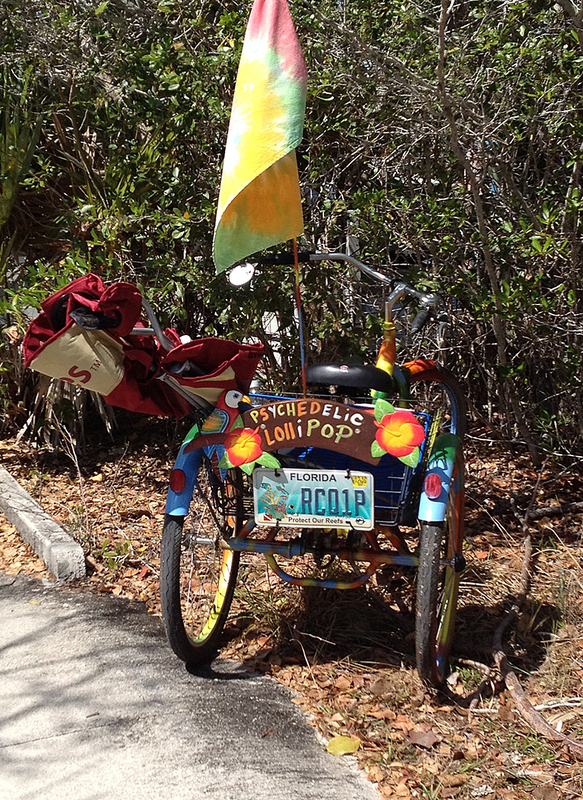 We arrived in Marathon on January 25th, and left on March 30th – just over two amazing, interesting, short, months. We met many new people and made many new friends. 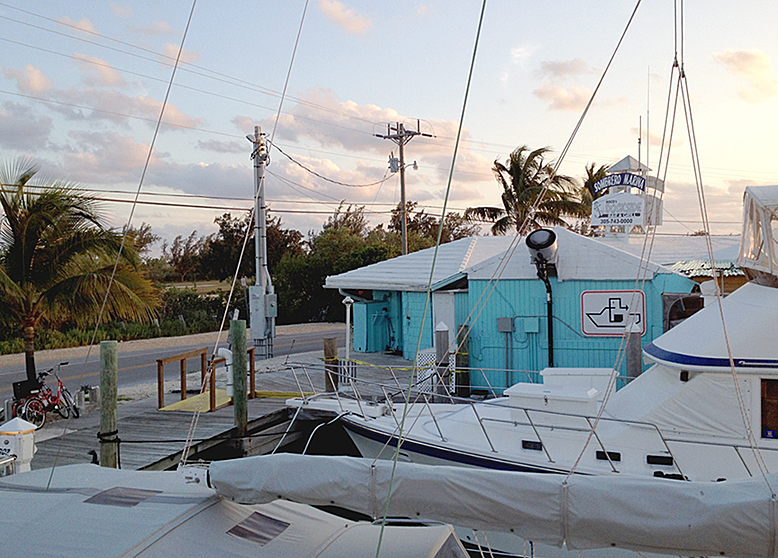 We stayed at Sombrero Dockside Marina. . . one of those “interesting” places! This post is a combination of what I started “back then,” and what I’ve added since we left. . . pardon any dis-jointedness!! It’s been way, WAY too long since I’ve posted on our blog, and I’m sorry about that. We have discovered that down here, with 9 days out of 10 being sunny and 75 degrees there is a sort of easy ripple of days rolling one after another with the tides and the breezes. (If it takes a day or two more to do something, well, that’s okay, right? Or a week or two, okay?) On that tenth day we get “partly sunny,” and maybe a 20 minute shower. That’s the day we’re supposed to get work done. It goes quickly. . . The Tiki Bar was closed a day or two before we arrived on January 15th. The bar was sinking. . . Yellow tape is draped around. For the first three weeks we were here there was some beeping timer alarm going off in there. But finally someone turned it off. It’s the Keys. . .
We are across the street from a golf course. Niya and I walk in the bike lane next to their fence (I’ve decided every community should have a bike lane!) every day. 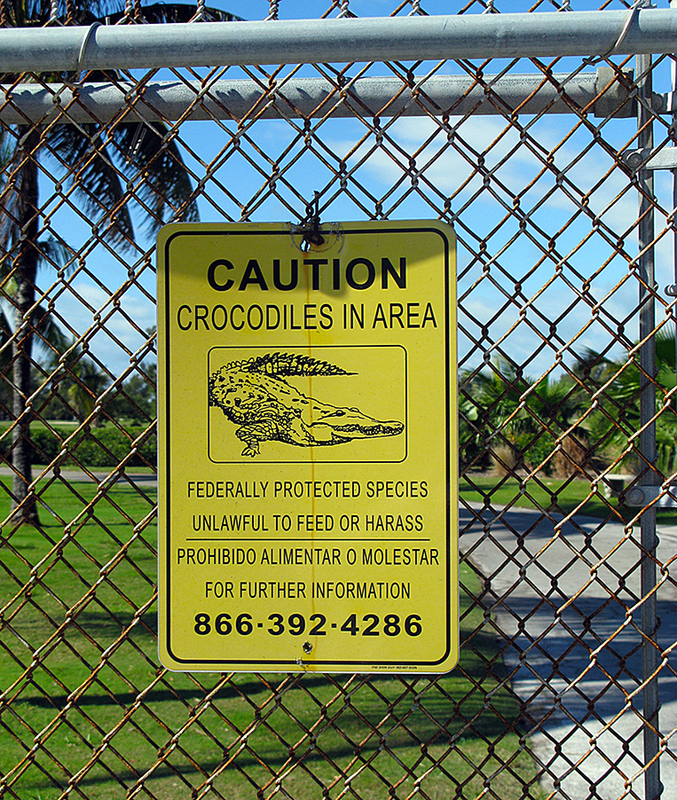 Here is a sign next to one of the gates in their fence. 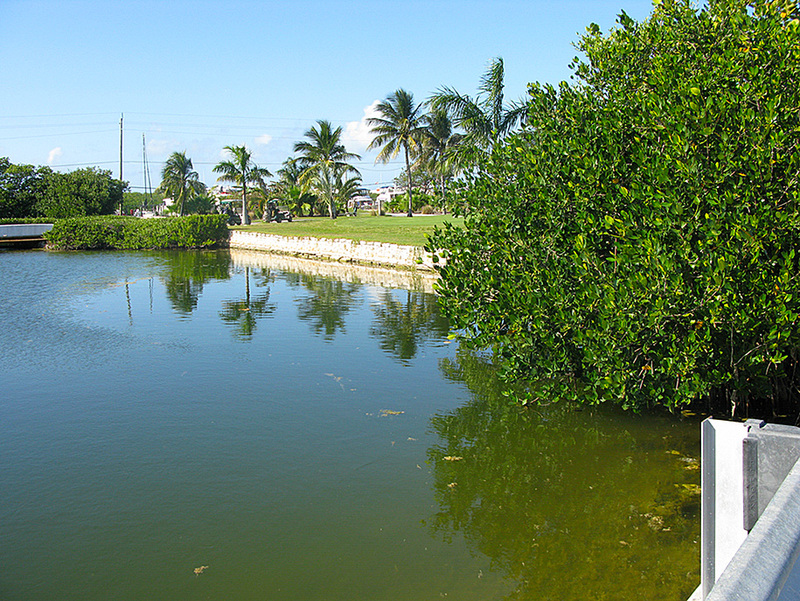 This is the pond where the crocodile has been seen. I tell Niya that if we are not going to feed the croc we need to hurry past! You can see our boat beyond the pond at the 10th hole. 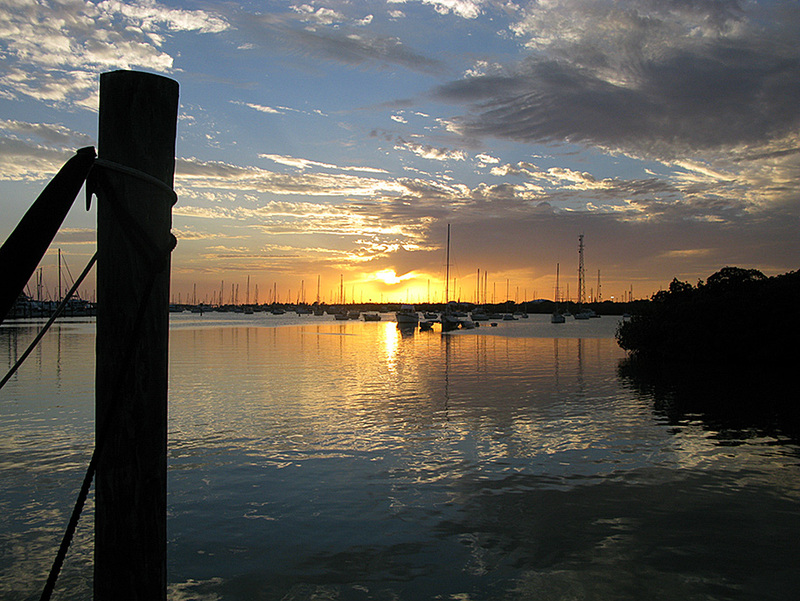 There is a mooring field in Boot Key Harbor and even though we are in a marina, we look out on the mooring field. Here are a couple of views of it. We had amazing sunsets over it almost every night as you can see. . . stop me when you’ve had enough. Some of the folks in there are living on little or nothing, some just like not to be attached to land. Some are there for a week or two, some have been there for years. 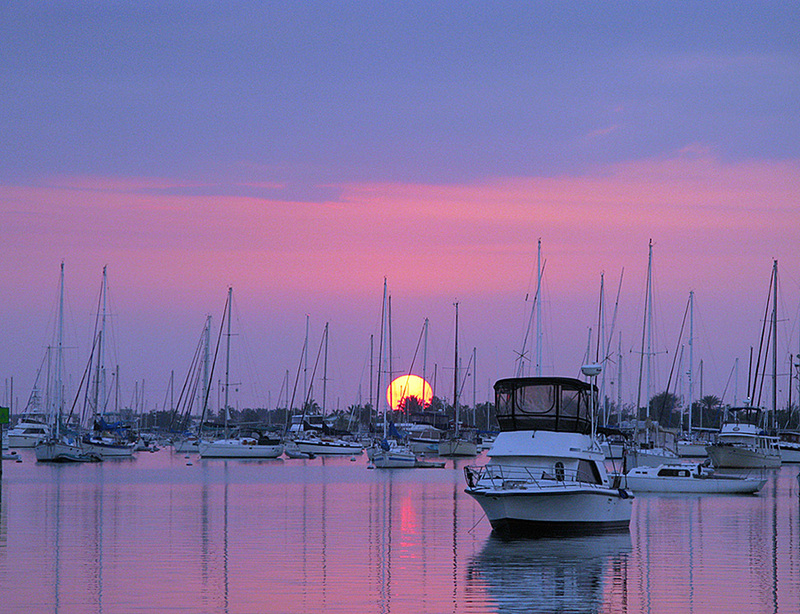 Every morning there’s a “Cruisers’ Net” on VHF Channel 68. It’s an amazing community resource, with a different moderator every day. People are hailed hello as new arrivals or farewell on their departure; people list their buy/sell/giveaway items; people list their questions or problems about engines, electronics, health care or whatever; people talk about doings: yoga, pick-up softball, the cheese man from Pennsylvania is back, don’t miss the new show at the local theater. . . It’s wonderful stuff! When you’re “on a mooring ball” (much less expensive than being in a slip at the dock) you come into a dinghy dock somewhere to do the laundry, or do some shopping, or commute to your job. There are definitely Keys Characters here. My theory is two-fold: 1.) 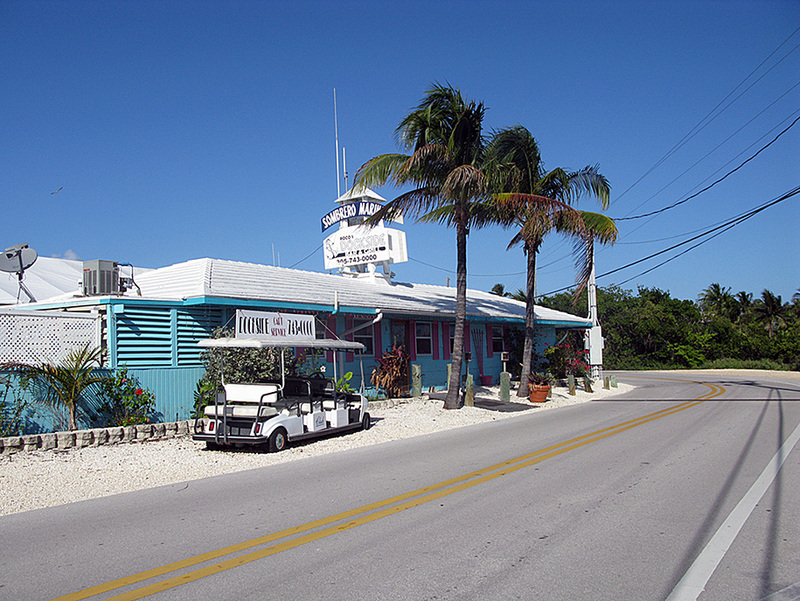 if you don’t fit anywhere else, go to the Keys, and 2.) 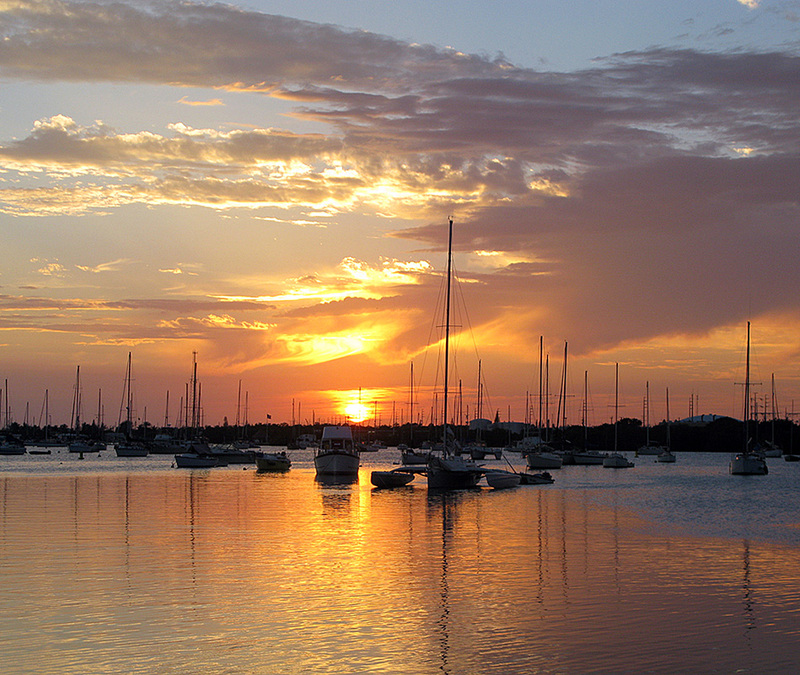 if you have nothing, nor any means of getting anything, go to the Keys. Here is a photo to prove #1. This man, who I have dubbed “Thor” for obvious reasons, has a vision. He’s living his vision, and I can tell you that others have just lapped it up, for there were several evenings when we saw him passing the stern of our boat with one. . . or more. 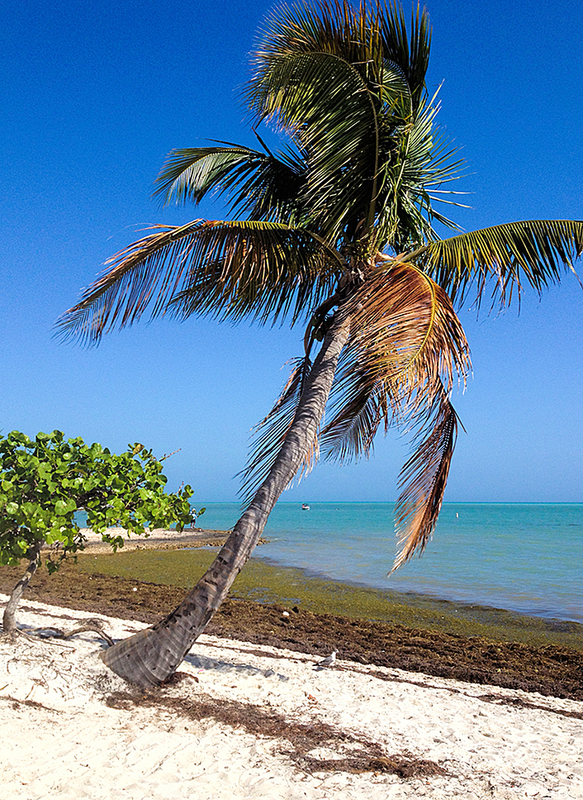 . . young lady in gauzy white dresses fluttering in slow motion in the breezes of the Keys. . . Yep, it almost looked like the cover of a lusty romance novel! And here is a photo to prove #2. 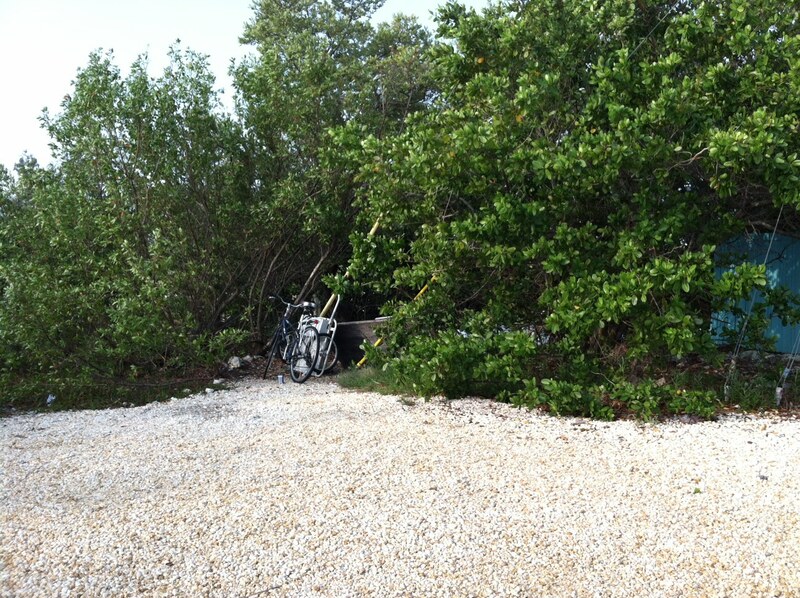 There was a man who lived in the mangroves across the street from the Tiki Bar. He was quite possessive about his home, and chased Hans off one evening when he was walking Niya just a bit too close. In the afternoon/evenings we often gather on the dock (there are always several gatherings on the dock) to talk about the day, the fishing or plans. Or war stories or boating fables. Once a week there’s a potluck. And occasionally we do “field trips” like this one, where a number of us dinghied over to a restaurant on the other side of the harbor. 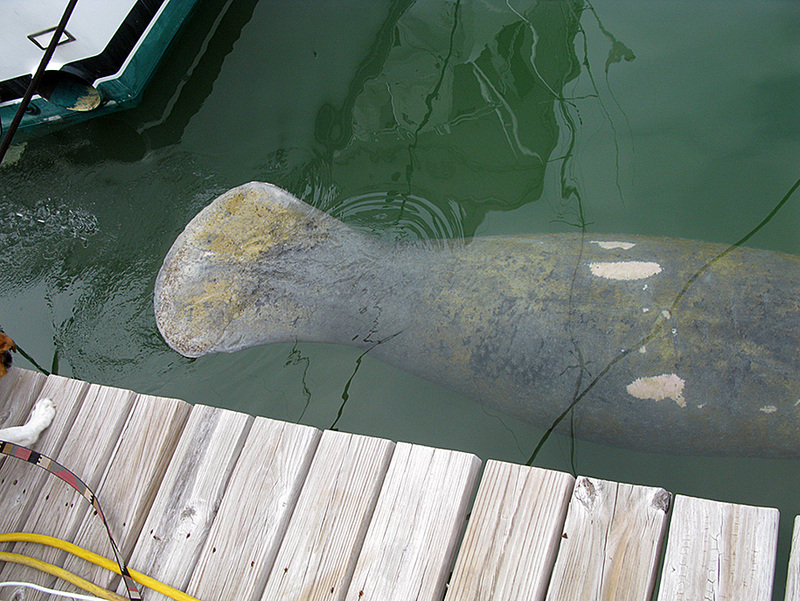 While there is the occasional dolphin this far back in the harbor, the manatees visit almost every day. One day there were seven of them! 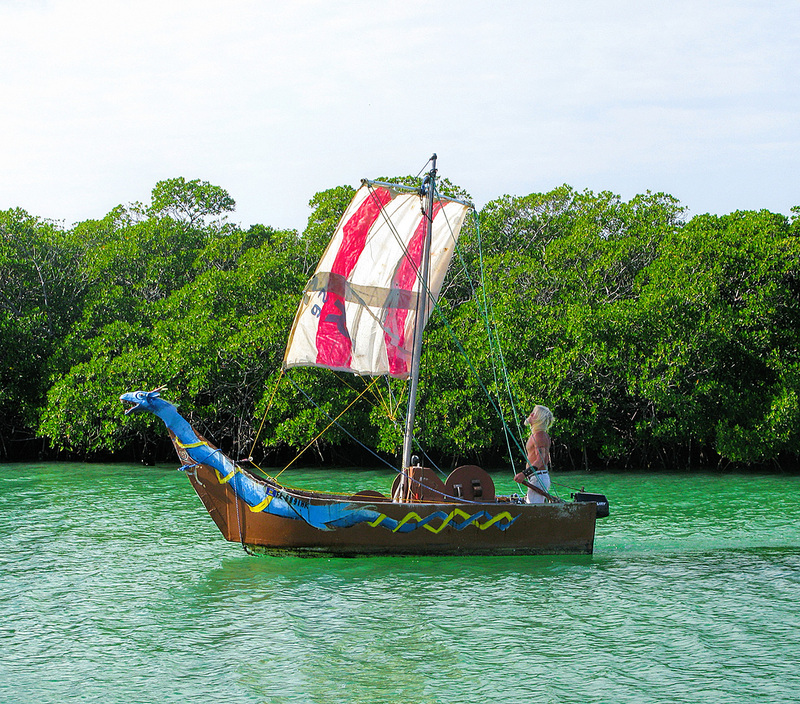 We never had that many come right to the dock — those were grazing along the shallows by the mangrove island behind us. But often we would have three or four, which would make their way, munching slowly along. They are UGLY! 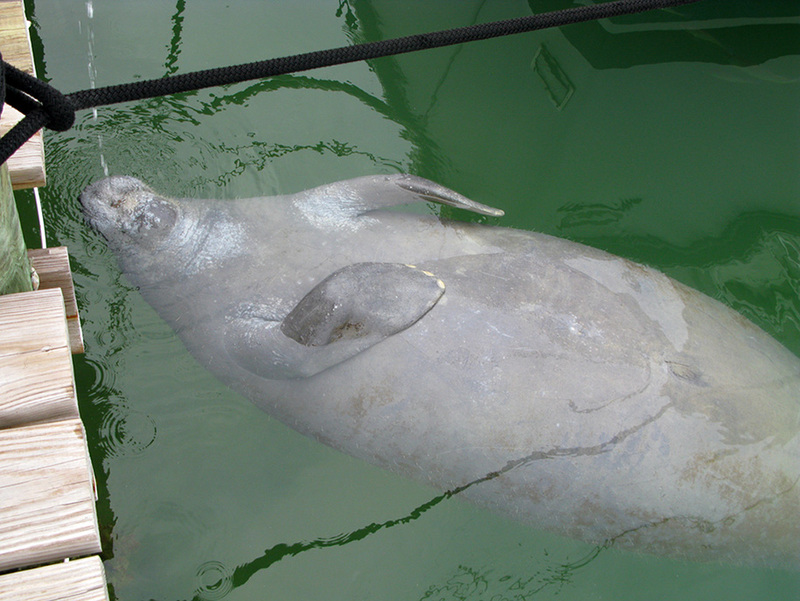 Gentle giants, most have prop scars along their backs where they’ve been struck by boats. They love (need) fresh water, so are enticed with a hose or rainwater falling off the boat. 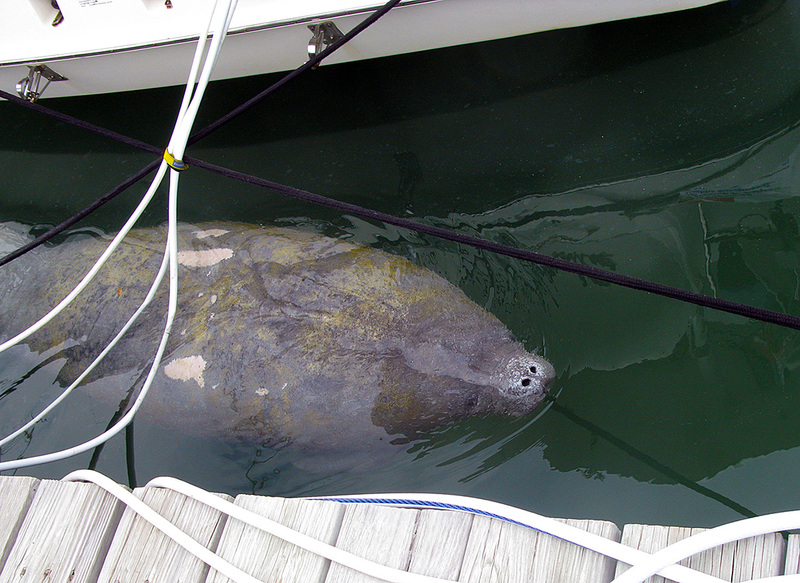 Deliberate coaxing is frowned upon with a $5,000 fine (they don’t want the manatees to become too comfortable around boats, which cause injury or death to these slow moving creatures.) 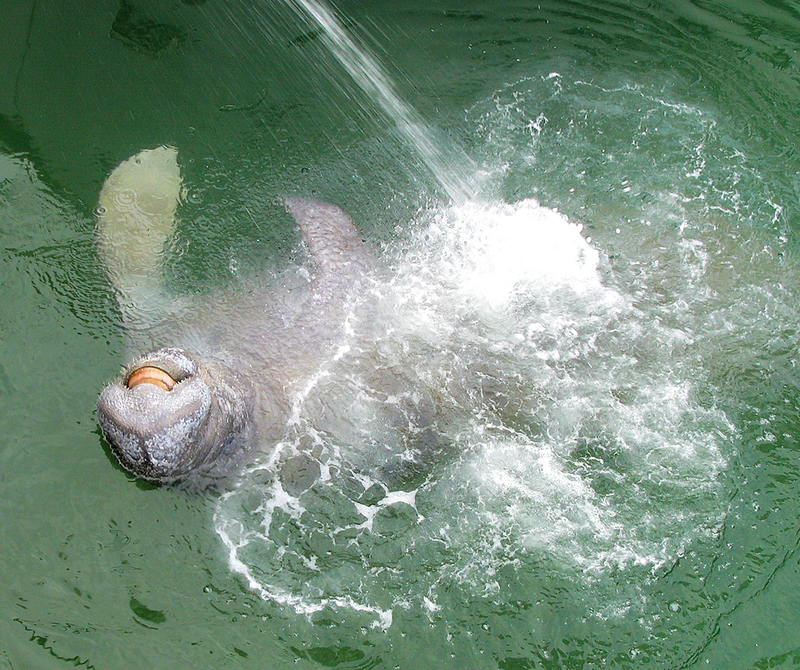 Except there was one manatee named Scotty who has been entangled so horribly in discarded fishing line that we’ve been asked to get out the water hose for him in if we see him, and to call any one of several authorities to come for him. They’re afraid that without surgery any other attempt to remove the line he would bleed to death. 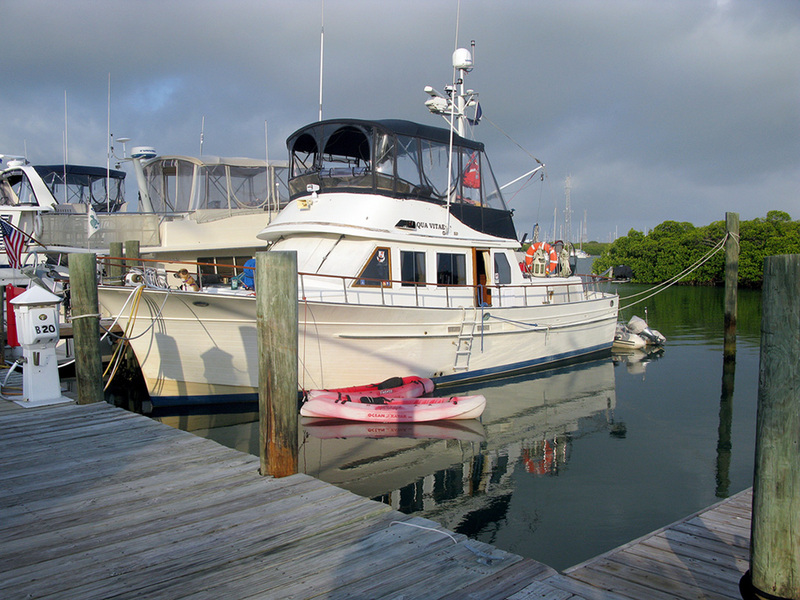 Here’s a sequence of photos that shows one that came to our dock coaxed by one of the boaters there. Much as I disapproved, I had to take pictures. You can definitely see the prop marks on this one, but some are worse. Did I say ugly?? 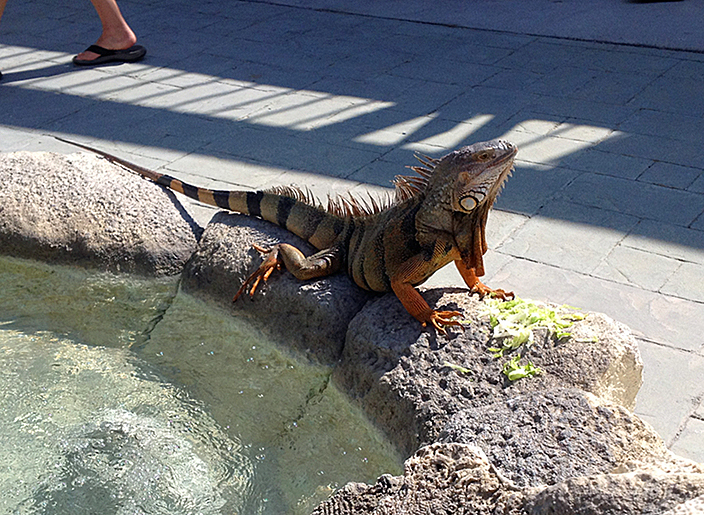 There are other critters in the Keys. 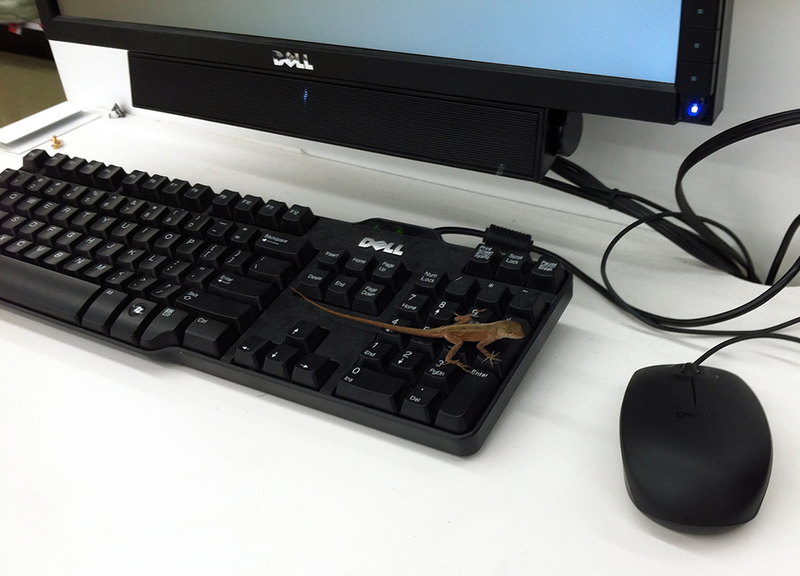 We have a lot of little lizards. They skitter along like dried palm fronds blown in the wind, and you usually have to be quick to see them. I believe that they are Anole Lizards, but Hans thinks they’re geckos. 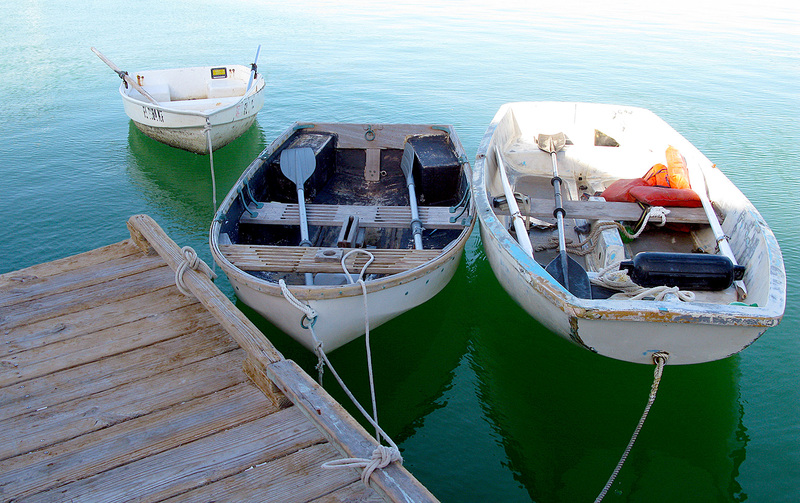 (We’ve brought two of them back on the boat, a bright green one, and a slightly smaller brown one. They no doubt boarded the boat via the dock lines somewhere.) This one was in K-Mart. . . The bigger lizards (MUCH BIGGER!) 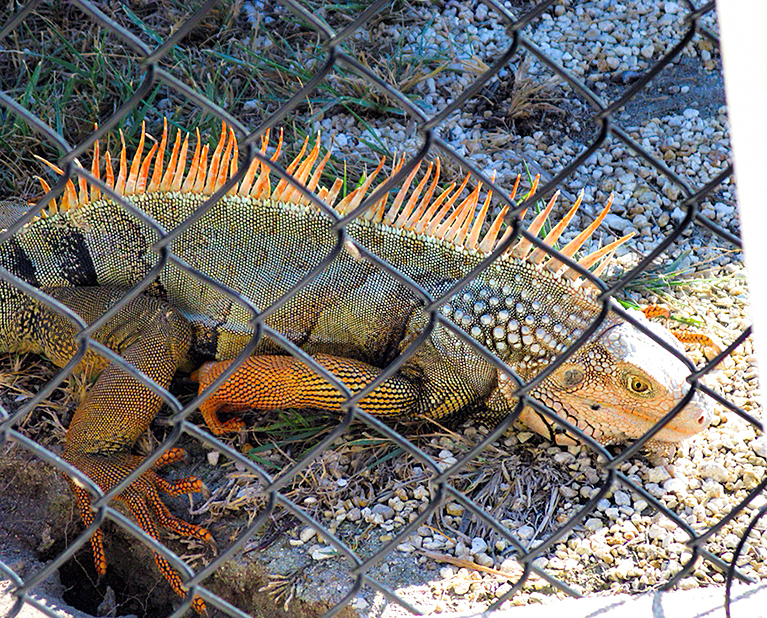 are Iguanas. They are not native here, but they’re everywhere. We’ve been told not to get too close, as they will lunge at you with claws out and they are reported to carry salmonella. They move fast, YIKES! 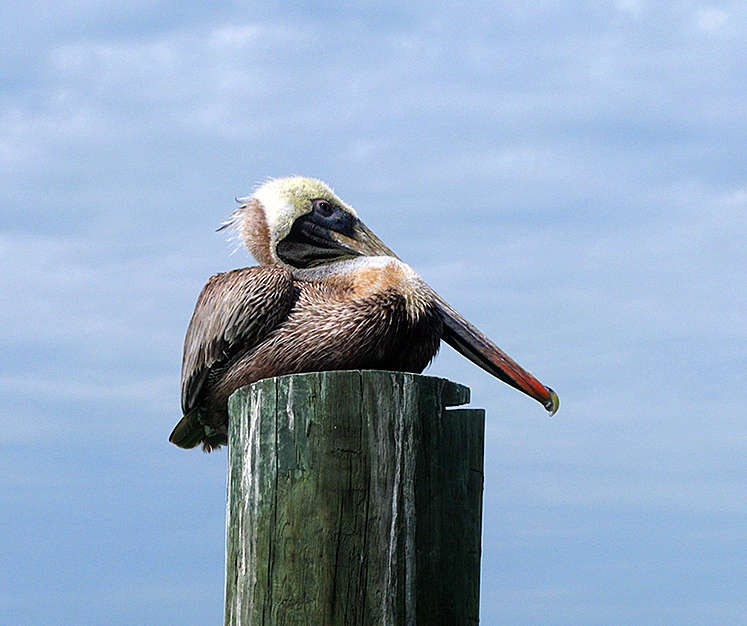 The pelicans are lovely/ugly, and are all around. . .
. . . as are the White Ibis, who I think look like little old men with long noses. 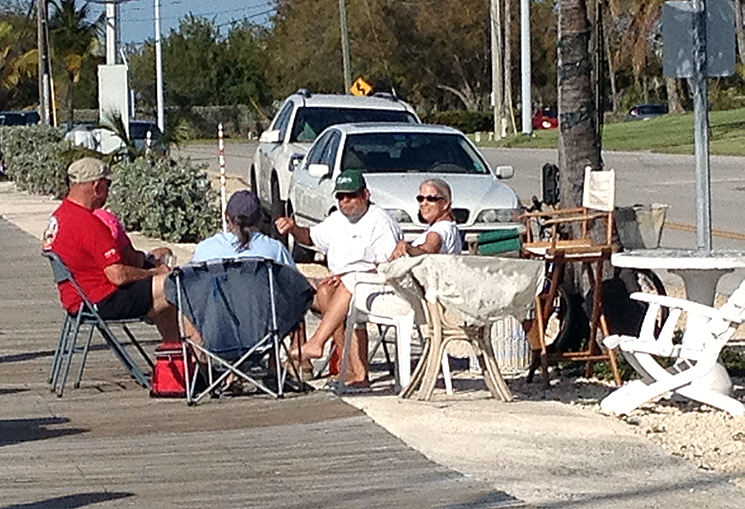 Some of the people in the marina go out to the reef and fish, but we see fish in the marina as well. The water is very clear on days when there is little wind. 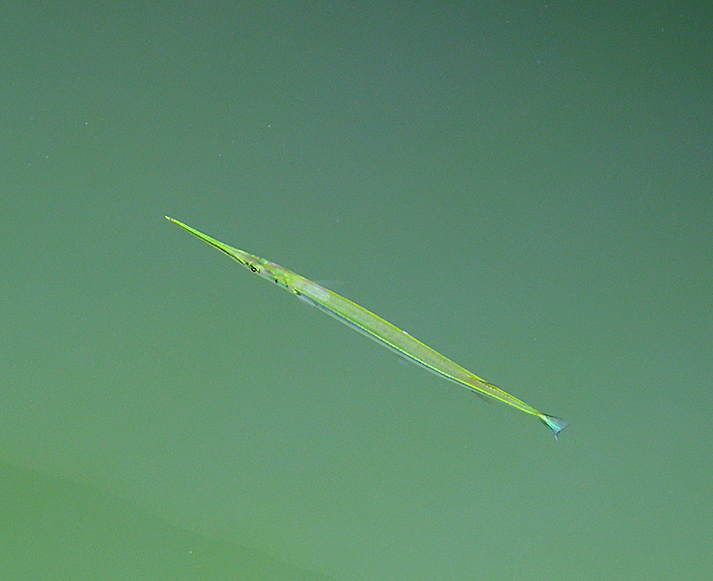 This is a Needle Fish that visited us one day, and there’s a young barracuda that comes for table scraps at slip B-1. 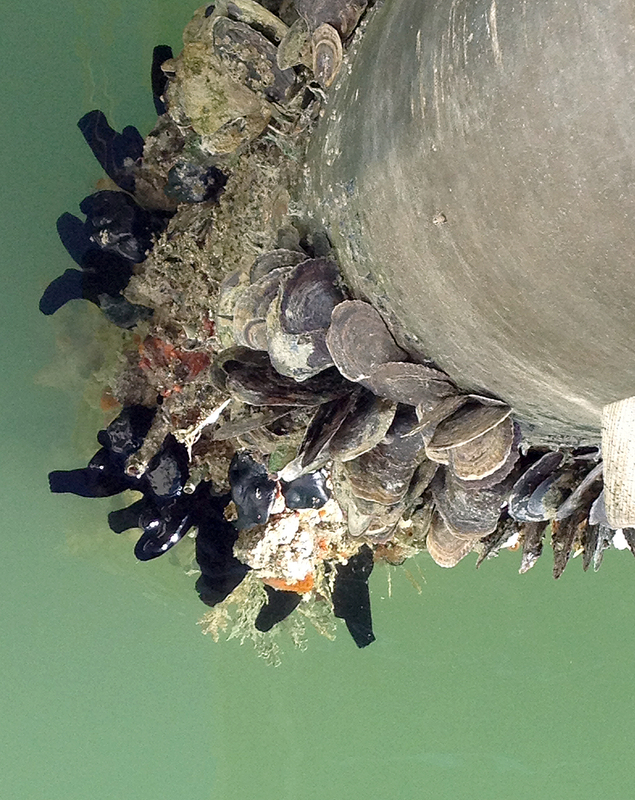 This is what grows on the pilings supporting the dock. Oysters of some sort, sea anemones, and I’m not sure what the orange stuff is, but I think that’s a critter too! There’s more, a lot more. . . I’ll save it for another post.